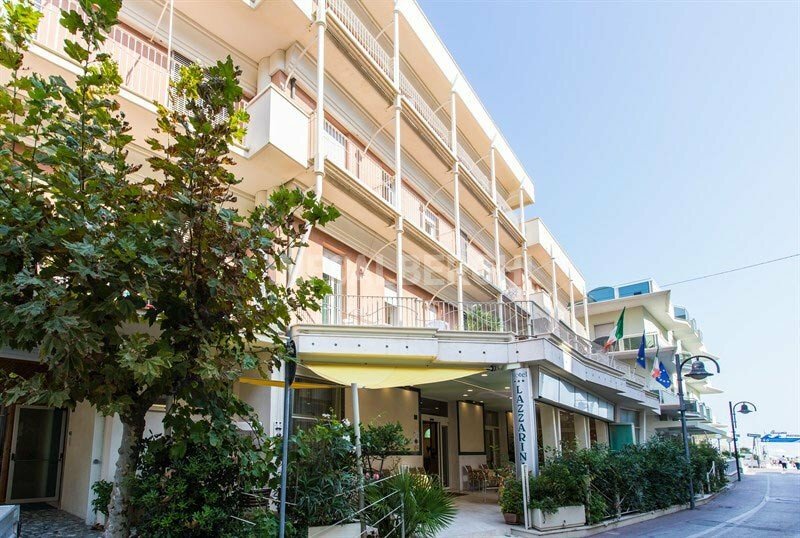 Three stars of Bellaria near the sea, Hotel Lazzarini is an eco-friendly hotel with parking and free WI-FI connection. Admits small pets. The hotel is located in Bellaria near the beach and just a few minutes walk from Isola dei Platani, the pedestrian center full of shops, ice cream parlors and restaurants. Guests can choose between suites, single, double, double, triple and quadruple rooms. All rooms have air conditioning, private bathroom with shower and hairdryer, safe, WI-FI, minibar on request, telephone, TV, balcony overlooking the sea or the back of the hotel. Breakfast in self-service room. Garden, sun terrace, free use of bicycles, gym, relaxation area (with color therapy, hydromassage, aromatherapy), lift, TV room, laundry service, Sunday aperitif. The hotel boasts Legambiente certification for its commitment to respecting nature. PARKING: uncovered while seats last. BREAKFAST: international buffet breakfast with homemade desserts, savory products and a corner of organic products. LUNCH AND DINNER: the cuisine is typical of Romagna and uses quality ingredients and GMO-free. For lunch and dinner you can choose between 3-4 menus with fish every day, accompanied by vegetables and appetizers buffet. OTHER: Every Sunday the guests are offered an aperitif. At meals: high chairs, baby menu, baby food, baby food, bottle warmer. The hotel has an agreement with Bagni 44-46. Easter in Romagna and April 25th in Bed and Brunch! Enjoy the first sun of Romagna! Offer for Easter and April 25 in Bellaria, in Formula Bed & Brunch (breakfast + American breakfast until 12:00), starting from € 35.00 per person per day. You can enjoy the sea and our territory freely. At Easter and for the 25th April bridge, enjoy the first sun in Romagna !! € 25.00 per day for children up to 8 years. You can enjoy the sea and the land in freedom!